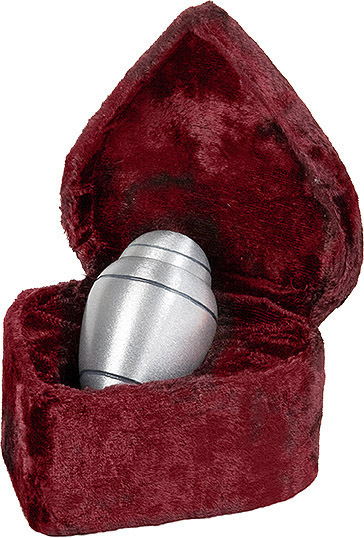 This Brushed Pewter Alloy urn is an affordable alternative to more expensive brass urns. A coat of clear polyurethane provides a maintenance free finish. Available is several sizes for all your needs. Urns have a felt base to protect furniture. 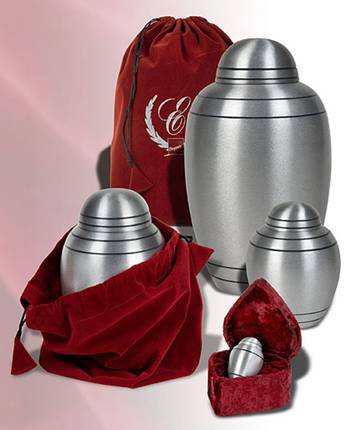 A free velvet urn pouch is included with the 6", 7", or 10" urn. Heart Velvet Case is included with the 3" keepsake. Large: 10" high, holds 202 cubic inches - appropriate for most adults with healthy body weights up to 200 lbs. Medium: 7" high, holds 87 cubic inches - appropriate for most young children or pets with healthy weights up to 55 pounds. Small: 6" high, holds 43 cubic inches - for families who want to share ashes or for infants and small pets weighing less than 20 pounds. Ships same day if ordered by 12pm EST. Ships from the East Coast.